The MIC280 is a digital thermal supervisor capable of measuring its own internal temperature and that of a remote PN junction. The remote junction may be an inexpensive commodity transistor, e.g., 2N3906, or an embedded thermal diode such as found in Intel Pentium* II/III/IV CPUs, AMD Athlon* CPUs, and Xilinx Virtex* FPGA's. A 2-wire SMBus* 2.0 compatible serial interface is provided for host communication. Remote temperature is measured with ±1°C accuracy and 9-bit to 12-bit resolution (programmable). Independent high, low, and over-temperature thresholds are provided for each zone. The advanced integrating A/D converter and analog front-end reduce errors due to noise for maximum accuracy and minimum guardbanding. The interrupt output signals temperature events to the host, including data-ready and diode faults. Critical device settings can be locked to prevent changes and insure failsafe operation. The clock, data, and interrupt pins are 5V-tolerant regardless of the value of VDD. They will not clamp the bus lines low even if the device is powered down. 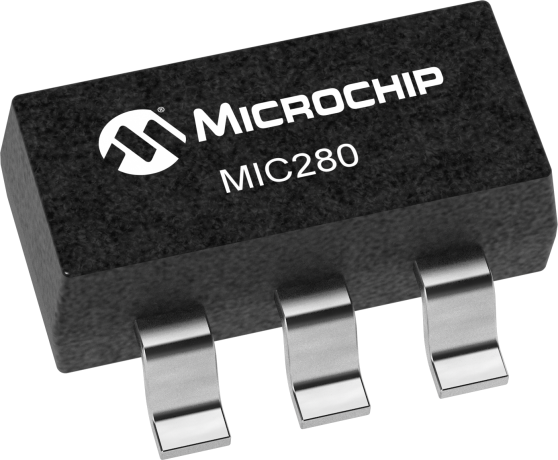 Superior accuracy, failsafe operation, and small size make the MIC280 an excellent choice for the most demanding thermal management applications.